Tagg On® clothes name labels are perfect for a respite stay or a longer term stay in a care or nursing home. These labels clip on seconds and can withstand high temperature washes. 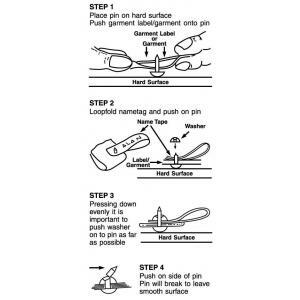 To attach, simply push the supplied stud through the nametag and the garment care label, press on the washer, snap off the end using the supplied tool and you’re done. Each order is supplied with enough taggits to attach all the labels ordered and no other tools are needed. 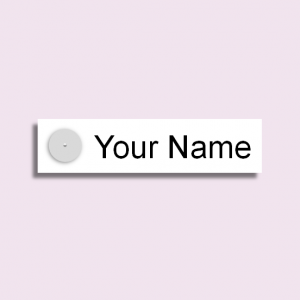 To order, simply type the name you want on the labels, choose your favourite image if you’d like one (or leave blank), font and colour then preview the finalised label design. Finally, select the quantity you'd like to order. All our printed tagg on labels ship the same day (orders before 2pm weekdays) with FREE UK delivery as standard. Our woven tagg on labels ship within 5 – 7 working days. A LIFETIME guarantee provides peace of mind. Not found what you want? Why not visit The Name Label Company site if you are looking for children's tagg on name labels. This care site is operated by The Name Label Company. Using our knowledge and experience we’ve designed this range of name labels specifically for the needs of care home residents. © 2012 - 2019 Care Home Label Company. All rights reserved.